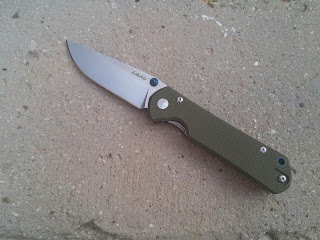 Best Chinese Knives: Sanrenmu Land 910 G10 Version Review! Sanrenmu Land 910 G10 Version Review! I finally received this knife and would like to do a short review on it. The knife came in a plain white thin cardboard box. Out of the box the knife is sharp and has no bladeplay at all. The centering is a little bit off, but it's not touching the liner. No fit and finish issues (other than the centering). - Great action. The blade rides on ball bearings and is very smooth (falls shut into the handle). - Good ergos. It is smaller than the genuine model (the Sebenza 21), but has similar ergos for my middle sized hand. - Loved the blue accents on the thumbstud and the lanyard tube. - Also liked the satin finish on the blade, the rounded spine (with the thick tip) and the fact that one of the liners is skeletonized to reduce weight. - The blade steel is Sandvik 12C27, which is a nice change from the MoV steels, keeps good edge and is comparable to Ganzo's 440C. - As I've mentioned before - the centering. Couldn't tweak it to center without messing up the lockup. Not a big issue, but it's always nicer when the blade is perfectly centered. - The G10 feels dry and is very grippy. I think I would have preferred a smoother finish on that. (EDIT: the G10 pattern on the black version is different and is a bit smoother (more similar to the G10 pattern on Ganzo knives)). - The pocket clip is a polished stainless imitation of the Sebenza clip. Works good, but could have been better with a different style one (like a deep carry foldover). Great budget all-around, nothing fancy, worker's blade, one that will fill most tasks needed from an EDC knife and one that you won't baby (because of the price and the construction). Good liner-lock alternative to Ganzo knives and a way to try the Sebenza's ergos and blade in action. I hope that after making a name for themselves with this one, Sanrenmu Land will continue to cheer us with the same quality of construction, but other, more interesting and original designs. Thank you for another great review. I have four of these, three with black G10 and one with the green G10. All but the green one have perfectly centered blades. Could you post picture of the centering? Thanks man, maybe it is an issue only met on the green version. I will take a pic of the centering soon. iimgsafe webserver down since days. The only "issue" that I have with my black 910+ is that the screws could be sunken in better. The pivot and pivot screw are perfect, the small screws could sit in deeper. Minor issue, the G10 is like on any Kershaw, CRKT, Camillus, SRM, Ganzo or Enlan knife I own. Yeah, there is a difference in the G10 pattern between the black and green versions, much "drier" and grippier on the greem one. I wonder if it is done intentionally or by coincidence. Well, I don't know as I got the black version. Blue G10 would look interesting with the blue thumb lugs and lanyard hole but green was a no go for me. I feel the thumb studs are too short on this knife and the blue wears off. Great working knife though! Have you seen this Sanrenmu 910 that seems to be a precursor to the 910+ and 9103/4? I just discovered it today, never saw it on Gearbest or Fasttech. It comes in orange as well as black and green. It has a secondary lock by the pivot which I've never seen on the budget Chinese knives. I wonder if it has the ball bearings...I think not because the 910+ must have something to call made it "plus". While it is probably a step down in terms of features the 2nd lock and relative scarceness makes me interested. Yeah, from the stats it seems that it is a bit smaller than the 910, but larger then the 710, so sort of a middle model between the 2. Should have called it the 810 :). Overall length: 20cm/7.87" Blade length: 8cm/3.15"
Pretty much the same, considering differnt measurements. Google for Mingren 910, that one was out some years ago after a first batch of SRM LAND 910+ was out, some people called it a Sanrenmu clone. It came with that extra lock already. When I've seen the new 910+ I had to get it right away because I was always too late for the "original" 910s, even the Mingren was always out of stock. On the new one the Sandvik steel is much better when it comes to edge retention than any 8/9Cr13/14MoV I've ever tried. If you want ball bearings and don't need an extra lock (or prefer framelocks) - go for the 910+/9103/4 (and buy the generic LAND name with it. If you want washers, the extra lock and the original SRM logo, try this one and tell us about it. ...and of course the new one comes with a Chris Reeve clip and CR thumb lugs whereas "the other" version has a Benchmade-y clip and Ganzo thumb studs. This is one of the few times I can say this is a really good knife...at any price, it's very well made, the fit and finish is great, and it carries well. It feels like a 100 dollar knife. Now if it were 100 dollars, I would want it to have a steel that holds an edge longer. 12c27 steel is a decent mid grade steel however. These knives were actually on sale at gearbest for $9.99...this knife would be a fair price at 50 bucks...it's that good. At prices lately between $9.99 and 18 bucks it is a no-brainer...best knife deal I've ever seen...period.